Join us as we visit the newest history museum in America! Our visit will begin with a one-hour guided introductory tour of the core exhibition galleries. Our group will learn about exhibit highlights, as well as key artifacts and stories alongside a member(s) of the museumls education staff. Using whisper technology, our group will use headsets to follow along with the guide. Next, our group will experience a special docent-led 30-minute presentation entitled "Making the Museum." 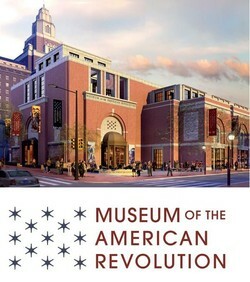 The Museum of the American Revolution opened in 2017, but it has a history that reaches back over a hundred years. Where did the museum's collection come from? How did an Episcopal minister in Valley Forge, Pennsylvania, acquire Washington's war tent, and what did that acquisition have to do with the American Civil War? How did this museum end up in downtown Philadelphia? What are the plans for the future? The presentation will answer these questions and more! Then we will take a threee-minute walk to Philadelphia's City Tavern for a delicious luncheon. Established in 1773, City Tavern is where the nation's founding fathers dined, drank and celebrated. Our group will dine in a private room and enjoy the most authentic 18th-century dining experience in America. Afterward, we will walk back to the museum for an hour of self-guided exploration. We encourage you to use the afternoon visit to view Washington's War Tent. It is the cornerstone piece in the museum's collection and is not covered on the guided tour, as it is accompanied by a short film. It truly is a must-see!